As part of our weekly segment, it’s time to fill you in on who we think is a future star in the making and with football back in full swing we thought we’d go with a star that has been likened to Neymar Jr.
Vinícius Júnior’s football career began in 2006 when his father took him to one of the branch offices of Flamengo in the Mutuá neighborhood of São Gonçalo where he lived. The son of a poor family, Vinícius moved to Abolição with one of his uncles to be closer to Flamengo’s training grounds, Ninho do Urubu(the “Vultures’ Nest”). In 2007, in addition to his training at Flamengo’s academy in São Gonçalo, he began futsal classes at Canto do Rio, a famous club in Niterói. He remained there until 2010. In 2009 when Vinícius was 9 years old, his parents took him to futsal tryouts for Flamengo. The club saw potential in him but asked him to return when he was a year older. He chose not to return for futsal. Instead, in August 2010, he took the test for Flamengo’s football team and passed. Vinícius was signed to a youth contract by Flamengo at age 10, and from the point onward was treated as a top prospect in the program. He was called up to the Brazil under-15 national team at the age of 13. In 2015, Vinícius lead Flamengo to win the Copa Votorantim, one of the major under-15 football tournaments in Brazil. He was the top scorer of the tournament with 6 goals in 9 matches. In 2016, Vinícius moved to the under-17 team, again a year younger than his teammates. Again he excelled, scoring 10 goals and leading the league in assists, delivering the 2016 Under-17 Rio de Janeiro State League title to Flamengo. He led Flamengo to victory in the São Paulo Youth Cup, the largest under-20 football competition in Brazil. Even though he was 3 years younger than the maximum age, Vinícius was one of the stars of the tournament. Flamengo signed Vinícius to a three-year professional contract as soon as he turned 16 (the minimum age that a player is allowed by law to sign a professional contract) with a buyout clause of €30 million and the club retaining 90% of his economic rights. Major European clubs like Barcelona and Real Madrid were among the first to express interest in signing the young striker after his outstanding performances at the youth level. 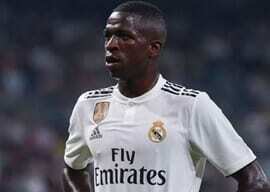 In May 2017, Spanish club Real Madrid signed a contract to acquire Vinícius, effective after his 18th birthday on 12 July 2018 (at age 18 is the minimum age for international transfer). He transferred for a reported fee of €46 million, which was at the time, the second most expensive sale of a player the history of Brazilian football (behind only Neymar), the largest amount received by a Brazilian club for a transfer (Neymar had cost Barcelona €86 million but Santos only received €17 million), and the highest amount ever paid by a club for a footballer under the age of 19. Vinícius’ skill and flare has been likened to Neymar and when you see the video below we’re sure you will agree.